Zen Meditation is a particular kind of meditation, that functions centrally as the very heart of the practice. In fact, Zen Buddhists are generally known as the "meditation Buddhists." Basically, Zen Meditation is the study of the self. The great Master Dogen said, "To study the Buddha Way is to study the self, to study the self is to forget the self, and to forget the self is to be enlightened by the ten thousand things." To be enlightened by the ten thousand things is to recognize the unity of the self and the ten thousand things. Upon his own enlightenment, Buddha was in seated meditation; Zen Meditation practice returns to the same seated meditation again and again. For two thousand five hundred years Zen meditation has continued, from generation to generation; it's the most important thing that has been passed on. It spread from India to China, to Japan, to other parts of Asia, and then finally to the West. It's a very simple practice. It's very easy to describe and very easy to follow. But like all other practices, it takes doing in order for it to happen. We tend to see body, breath, and mind separately, but in Zen Meditation they come together as one reality. 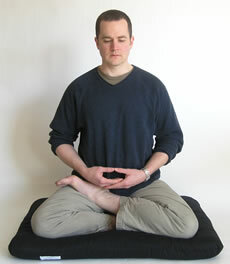 The first thing to pay attention to is the position of the body in Zen Meditation. The body has a way of communicating outwardly to the world and inwardly to oneself. How you position your body has a lot to do with what happens with your mind and your breath. Throughout the years of the evolution of Buddhism, the most effective positioning of the body for the practice of Zen Meditation has been the pyramid structure of the seated Buddha. Sitting on the floor is recommended because it is very stable. 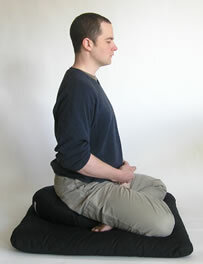 We use a zafu - a small pillow - to raise the behind just a little, so that the knees can touch the ground. With your bottom on the pillow and two knees touching the ground, you form a tripod base that gives three hundred and sixty-degree stability. 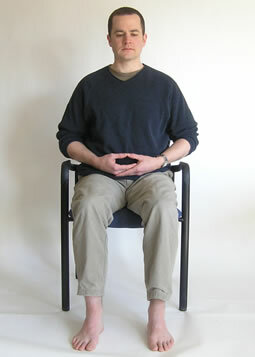 In Zen Meditation there are several different leg positions that are possible while seated this way. 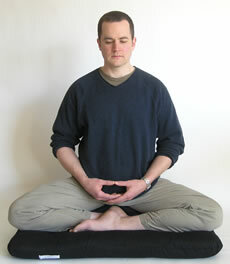 The first and simplest is the Burmese position, in which the legs are crossed and both feet rest flat on the floor. The knees should also rest on the floor, though sometimes it takes a bit of exercise to be able to get the legs to drop that far. After awhile the muscles will loosen up and the knees will begin to drop. 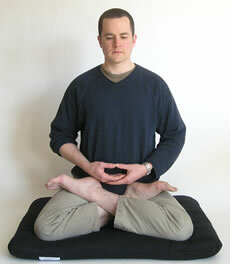 To help that happen, sit on the front third of the zafu, shifting your body forward a little bit. By imagining the top of your head pushing upward to the ceiling and by stretching your body that way, get your spine straight - then just let the muscles go soft and relax. With the buttocks up on the zafu and your stomach pushing out a little, there will be a slight curve in the lower region of the back. In this position, it takes very little effort to keep the body upright. Another Zen Meditation position is the half lotus, where the left foot is placed up onto the right thigh and the right leg is tucked under. This Zen Meditation position is slightly asymmetrical and sometimes the upper body needs to compensate in order to keep itself absolutely straight. By far the most stable of all the Zen Meditation positions is the full lotus, where each foot is placed up on the opposite thigh. This is perfectly symmetrical and very solid. Stability and efficiency are the important reasons sitting cross-legged on the floor works so well. There is absolutely no esoteric significance to the different positions. What is most important in Zen Meditation is what you do with your mind, not what you do with your feet or legs. 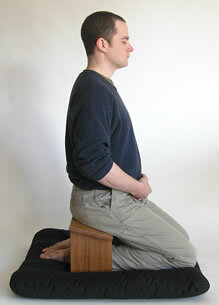 There is also the seiza position. You can sit seiza without a pillow, kneeling, with the buttocks resting on the upturned feet which form an anatomical cushion. Or you can use a pillow to keep the weight off your ankles. 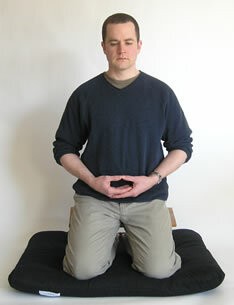 A third way of sitting seiza is to use the seiza bench. It keeps all the weight off your feet and helps to keep your spine straight. Finally, it's fine to sit in a chair with your feet flat on the floor. 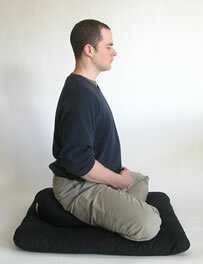 You can use the cushion, or zafu, the same way you would use it on the floor - sitting on the forward third of it. Alternatively, you can place the zafu at the small of the back. It's very important to keep the spine straight with the lower part of the back curved. 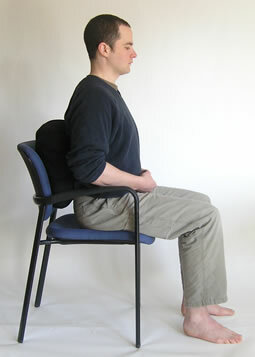 All of the aspects of the posture that are important when seated on the floor are just as important when sitting in a chair. The importance of keeping the back straight is to allow the diaphragm to move freely. The breathing you will be doing in Zen Meditation becomes very, very deep. Your abdomen will rise and fall much the same way an infant's belly rises and falls. In general, as we mature, our breathing becomes restricted, and less and less complete. We tend to take shallow breaths in the upper part of the chest. Usually, we've got our belts on very tight or we wear tight clothing around the waist. As a result, deep, complete breathing rarely occurs. In Zen Meditation it is important to loosen up anything that is tight around the waist and to wear clothing that is non-binding. For instance, material should not gather behind the knees when you cross the legs, inhibiting circulation. Allow the diaphragm to move freely so that the breathing can be deep, easy, and natural. You don't have to control it. You don't have to make it happen. It will happen by itself if you assume the right posture and position your body properly. Once you've positioned yourself, there are a few other things you can check on. The mouth is kept closed. Unless you have some kind of a nasal blockage, breathe through your nose. The tongue is pressed lightly against the upper palate. This reduces the need to salivate and swallow. The eyes are kept lowered, with your gaze resting on the ground about two or three feet in front of you. Your eyes will be mostly covered by your eyelids, which eliminates the necessity to blink repeatedly. The chin is slightly tucked in. Although Zen Meditation looks very disciplined, the muscles should be soft. There should be no tension in the body. It doesn't take strength to keep the body straight. The nose is centered in line with the navel, the upper torso leaning neither forward nor back. The hands are folded in the cosmic mudra. The dominant hand is held palm up holding the other hand, also palm up, so that the knuckles of both hands overlap. If you're right-handed, your right hand is holding the left hand; if you're left-handed, your left hand is holding the right hand. The thumbs are lightly touching, thus the hands form an oval, which can rest on the upturned soles of your feet if you're sitting full lotus. If you're sitting Burmese, the mudra can rest on your thighs. The cosmic mudra tends to turn your attention inward. There are many different ways of focusing the mind. There are visual images called mandalas that are used in some traditions as a point of concentration. There are mantras, or vocal images. There are different kinds of mudras used in various Eastern religions. In Zen Meditation, we focus on the breath. The breath is life. The word "spirit" means breath. The words "ki" in Japanese and "chi" in Chinese, meaning power or energy, both derive from breath. Breath is the vital force; it's the central activity of our bodies. Mind and breath are one reality: when your mind is agitated your breath is agitated; when you're nervous you breathe quickly and shallowly; when your mind is at rest the breath is deep, easy, and effortless. It is important to center your attention in the hara. The hara is a place within the body, located two inches below the navel. It's the physical and spiritual center of the body. Put your attention there; put your mind there. As you develop your Zen Meditation, you'll become more aware of the hara as the center of your attentiveness. Begin rocking the body back and forth, slowly, in decreasing arcs, until you settle at your center of gravity. The mind is in the hara, hands are folded in the cosmic mudra, mouth is closed, tongue pressed on the upper palate. You're breathing through the nose and you're tasting the breath. Keep your attention on the hara and the breath. Imagine the breath coming down into the hara, the viscera, and returning from there. Make it part of the whole cycle of breathing. We begin working on ourselves by counting the breath, counting each inhalation and each exhalation, beginning with one and counting up to ten. When you get to ten, come back to one and start all over. The only agreement that you make with yourself in this process is that if your mind begins to wander - if you become aware that what you're doing is chasing thoughts - you will look at the thought, acknowledge it, and then deliberately and consciously let it go and begin the count again at one. The counting is a feedback to help you know when your mind has drifted off. Each time you return to the breath you are empowering yourself with the ability to put your mind where you want it, when you want it there, for as long as you want it there. That simple fact is extremely important. We call this power of concentration joriki. Joriki manifests itself in many ways. It's the center of the martial and visual arts in Zen. In fact, it's the source of all the activity of our lives. When you've been practicing this process for a while, your awareness will sharpen. You'll begin to notice things that were always there but escaped your attention. Because of the preoccupation with the internal dialogue, you were too full to be able to see what was happening around you. The process of Zen Meditation begins to open that up. When you're able to stay with the counting and repeatedly get to ten without any effort and without thoughts interfering, it's time to begin counting every cycle of the breath. Inhalation and exhalation will count as one, the next inhalation and exhalation as two. This provides less feedback, but with time you will need less feedback. Eventually, you'll want to just follow the breath and abandon the counting altogether. Just be with the breath. Just be the breath. Let the breath breathe itself. That's the beginning of the falling away of body and mind. It takes some time and you shouldn't rush it; you shouldn't move too fast from counting every breath to counting every other breath and on to following the breath. If you move ahead prematurely, you'll end up not developing strong joriki. And it's that power of concentration that ultimately leads to what we call samadhi, or single-pointedness of mind. In the process of working with the breath, the thoughts that come up, for the most part, will be just noise, just random thoughts. Sometimes, however, when you're in a crisis or involved in something important in your life, you'll find that the thought, when you let it go, will recur. You let it go again but it comes back, you let it go and it still comes back. Sometimes that needs to happen. Don't treat that as a failure; treat it as another way of practicing. This is the time to let the thought happen, engage it, let it run its full course. But watch it, be aware of it. Allow it to do what it's got to do, let it exhaust itself. Then release it, let it go. Come back again to the breath. Start at one and continue the process. Don't use Zen Meditation to suppress thoughts or issues that need to come up. Scattered mental activity and energy keeps us separated from each other, from our environment, and from ourselves. In the process of sitting, the surface activity of our minds begins to slow down. 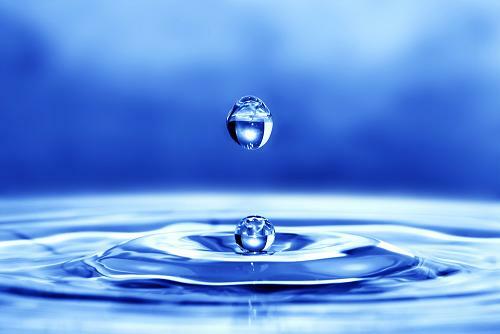 The mind is like the surface of a pond - when the wind is blowing, the surface is disturbed and there are ripples. Nothing can be seen clearly because of the ripples; the reflected image of the sun or the moon is broken up into many fragments. Out of that stillness, our whole life arises. If we don't get in touch with it at some time in our life, we will never get the opportunity to come to a point of rest. In deep Zen Meditation, deep samadhi, a person breathes at a rate of only two or three breaths a minute. Normally, at rest, a person will breathe about fifteen breaths a minute - even when we're relaxing, we don't quite relax. The more completely your mind is at rest, the more deeply your body is at rest. Respiration, heart rate, circulation, and metabolism slow down in deep Zen Meditation. The whole body comes to a point of stillness that it doesn't reach even in deep sleep. This is a very important and very natural aspect of being human. It is not something particularly unusual. All creatures of the earth have learned this and practice this. It's a very important part of being alive and staying alive: the ability to be completely awake. Once the counting of the breath has been really learned, and concentration, true one-pointedness of mind, has developed, we usually go on to other practices such as koan study or shikantaza ("just sitting"). This progression should not be thought of in terms of "gain" or "promotion"; that would imply that counting the breath was just a preparation for the "real" thing. Each step is the real thing. Whatever our practice is, the important thing is to put ourselves into it completely. When counting the breath, we just count the breath. It is also important to be patient and persistent, to not be constantly thinking of a goal, of how the sitting practice may help us. We just put ourselves into it and let go of our thoughts, opinions, positions - everything our minds hold onto. The human mind is basically free, not clinging. In Zen Meditation we learn to uncover that mind, to see who we really are.